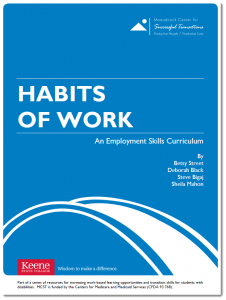 The Habits of Work curriculum is designed for use with internships and other work-based learning experiences. Use the Habits of Work website to explore the curriculum, connect to the many linked web resources, and download/print the parts you want. Each unit has introductory activities, activities to do at a worksite, and follow-up activities for both individuals and groups. 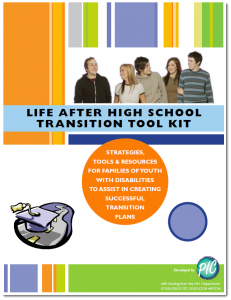 The Life After High School Transition Tool Kit helps families and youth who have an Individualized Education Program (IEP) learn about the transition planning process. It provides an overview of the laws relating to transition as well as best practices. The sections are: Thinking About the Future, Making a Plan, Writing the Transition Plan in the IEP, What Else Do I Need to Know, Review and Revise, and Give Youth an Opportunity to Get Involved. See the Parent Information Center on Special Education’s website for more information about the tool kit as well as links to download a section or the whole tool kit. 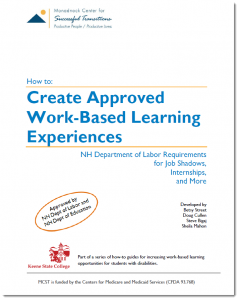 Create Approved Work-Based Learning Experiences will help the reader navigate the NH Department of Labor (DOL) process for obtaining approval for work-based learning experiences (job shadows, internships, and other programs). It contains step-by-step instructions for the two required approval processes to set up appropriate work-based learning experiences. Included are examples of forms and letters from New Hampshire schools, sample career objectives, and an overview of child labor laws. Approved by both the NH DOL and the NH Department of Education. Although this guide is drifting out of date, the basic explanations and approval flow are still accurate. PDF, 54 pages, 2010. 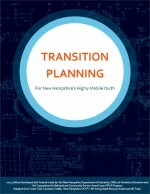 Transition Planning for New Hampshire’s Highly Mobile Youth was designed by young adults who had recently transitioned to adulthood, and is aimed at young people about to begin the journey. There are sections on finance and money, job and career, establishing a legal identity, life skills, self care and health, housing and community, and more. The publication provides planning templates to help students figure out what assets they have already, document their available resources, write down their plans, and determine their readiness to accomplish the plans. PDF, 114 pages, 2014. 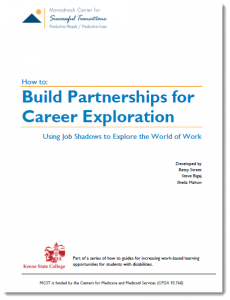 Build Partnerships for Career Exploration guides high schools in collaborating with an organization to plan and carry out a job shadow day. The booklet describes necessary preparation at the high school as well as at the hosting site, provides detailed reminders for the job shadow day and follow-up activities, and includes a suggested task timeline. PDF, 24 pages, 2010. 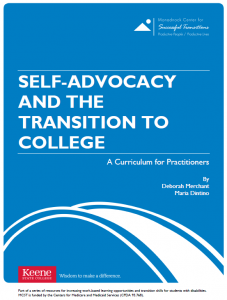 Self-Advocacy and the Transition to College is an eight-lesson curriculum for teachers and service providers that addresses the specific needs of students with disabilities as they get ready for postsecondary education. The goal is to help students understand their disability, realize how it impacts their learning, learn what accommodations are needed, communicate effectively about those needs, and know their rights and responsibilities under the law. PDF, 58 pages, 2011. 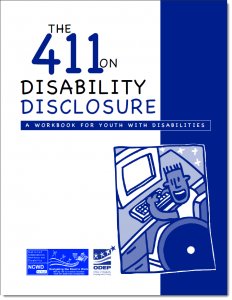 The 411 on Disability Disclosure: A Workbook for Youth with Disabilities is designed for youth and adults working with them to learn about disability disclosure. This workbook helps young people make informed decisions about whether or not to disclose their disability. It also helps them understand how that decision may impact their education, employment, and social life. Flexible options allow the user to download or view the whole workbook or individual parts in either PDF or Word format. An audiobook is available as well. This website and the Next Steps NH products on it are public domain. Authorization to reproduce them in whole or in part is granted. While permission to reprint publications on this website is not necessary, the citation should be: NH State Personnel Development Grant – Next Steps NH (2012-2017). New Hampshire Department of Education, Concord, New Hampshire, Author(s). Publications on this website that were not developed by Next Steps NH may have their own copyright rules. Check the individual document for specifics.